Okra originated in Africa and South Asia, although it can be found almost anywhere with a warm, temperate climate. 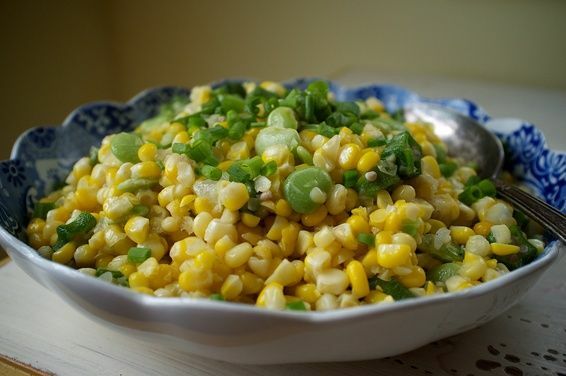 It's used in cuisine from the Middle East to India, and during the slave trade it was brought to the American South, where it became an important part of the Creole and Cajun cooking traditions (most famously as a thickener in gumbo). 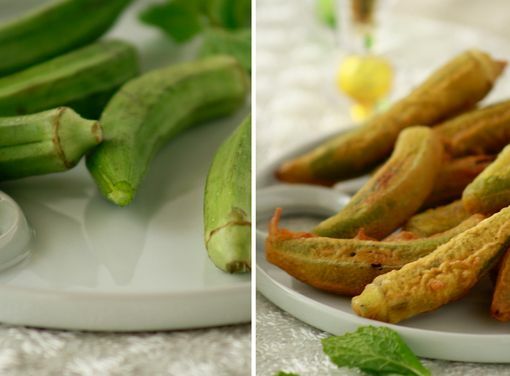 Okra also takes well to breading and frying, and, in the longer term, to pickling. But don't cook them in aluminum or cast iron -- the surfaces react with the okra to discolor it black. 1. Seed Pods: It's easy to see that okra is related to hibiscus when you see its flowers -- their wide petals with a burst of color at the center look just like the tropical plant. 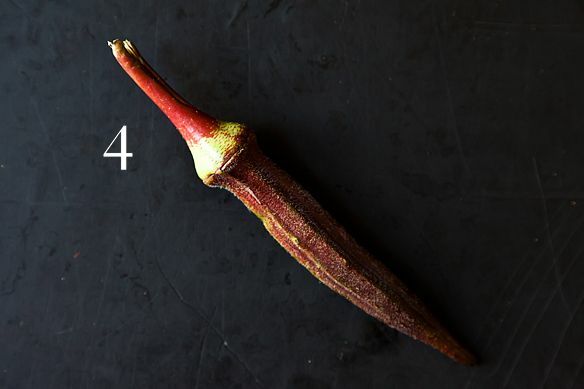 The part of okra that we eat is the flower's seed pod; after blooming for just one day, the flower wilts and leaves behind a pod that grows quickly in length. Okra should be harvested when still young, at a maximum length of 6 inches. After that they start to become tough-skinned, with too much mucilage inside for use as anything but a thickener. 3. 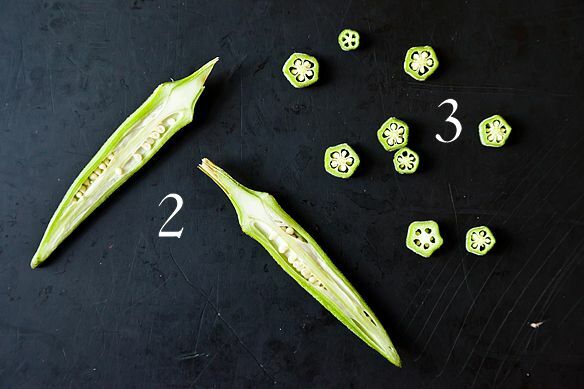 All-Star Gumbo: For use as a thickener in an authentic Cajun gumbo, cut okra pods in small pieces in order to maximize their surface area for thickening. Aren't their star shapes so beautiful? 4. Purple Okra: Keep an eye out at your local farmer's market for purple okra. 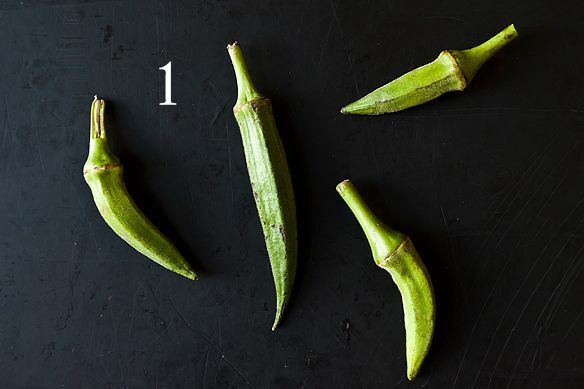 Like purple green beans, they lose their color and turn dark green after cooking, but they lend a gorgeous pink hue to the vinegar of pickled okra, and their insides are said to be slightly less mucilaginous. 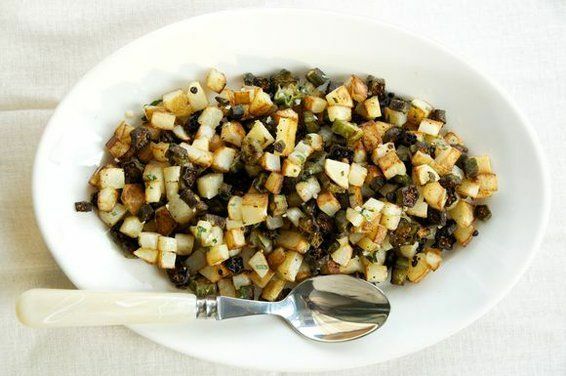 Our own Tom Hirschfeld is a big fan of okra, we found out while looking for okra recipes -- if you like your plant crispy, be sure to try his Burnt Okra with Sauteed Potatoes and Basil. I love okra and I don't mind the slime. Bring it. I'm a bit of a skeptic though on the advice about not using cast iron to cook it. Traditionally gumbo is cooked in a well seasoned, cast iron gumbo pot with no harm. Same for deep fried okra. A shout out to my friends in New Orleans after Issac. I hope you are well. this is the summer that i finally figured okra out. the trick for our house is blasting it at a high enough temp to keep it from getting all gooey. under the broiler in the oven with a little salt, pepper, paprika and cumin makes it snackable. never even makes it to the dinner table. They are also fun for children to use as stamps with paint to make lovely patterns. Hello, I live in Tobago in the Caribbean and ochro (as we call it) is a staple. Everyone has them in their fridge ALL the time. One of our Sunday staple dishes is called callalloo which is a combination of dasheen bush (which are the leaves of the taro plant) or spinach, ochro, coconut milk lots of herbs and a hot pepper (Scotch Bonnet) to top it off. Boil everything together, take out the pepper of course, and when the spinach leaves are cooked swizzle it all up. (ever heard of a swizzle stick?) and you get a healthy, rich-in-iron, tasty meal. Some people even put salted beef or pork in it too. Delish. Ochro and rice is also delicious and healthy packed with veggies like carrots, pumpkin, sweet peppers and any meat of you choice. It's like a risotto! I just buy little ones at the greenmarket and eat them raw. I've been grilling them in a holey pan on my backyard grill. the char is delicious! I love okra, made some last night with some Indian spices (mustard seeds, cumin seeds, ginger, turmeric) -- I find that if you saute them at a high heat it seals in their sliminess... But I also really like just quickly roasting them in the toaster oven with some salt and pepper for a little snack as I'm cooking dinner.